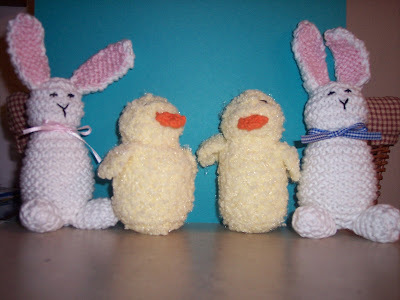 I finished these sweet little chicks and bunnies and since there is still plenty of time before Easter to knit your own - I wanted to share them with you. These truly were some of the easiest things I have ever knit. You only need the most basic of skills (casting on and the knit stitch), small bits of yarn, and perhaps a child to give them to. You can get the pattern from Susan B. Anderson of Itty Bitty Hats fame. Just scroll down a little ways and look for the photo on the left side of her blog. She will send them to you as a pdf file and you can start on them this evening! I just love her patterns - and they are always easy to follow. Honestly, if you can knit a square, you can make these. I used Bernat's Cotton Tot yarn in white for the bunny. I love the feel of this yarn and it is very inexpensive. I picked mine up at JoAnn's. Any cotton yarn will do. For the chick I had some yellow chenille looking yarn already, so I just used that. Go ahead and try them. You know you want to! 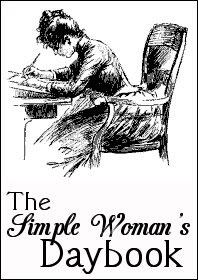 It's time for the Simple Woman Daybook. Go here is you like them and want to join in. Outside my window...I am at work and it is the week after spring break. It's good to see the students walking around campus again. I am thinking... that life can be so hard sometimes. I have a friend who is really hurting right now - and I don't know how to help her. I am thankful for... the fact that the wind has calmed down to a breezy 10mph instead of the 55mph winds we had yesterday. From the learning rooms... I am learning some advanced knitting techniques working on Mr. Foster - the knitted sock monkey! Every row has been a challenge - but it is fun. From the kitchen... I discovered there is a mouse in my kitchen. Therefore, I am not. I am wearing... a sweater that is beginning to feel a bit too warm. I am going... to get some film developed that has been sitting around the house for many years. It should be interesting since I have absolutely no idea what is on them! I am reading... A Debbie Bliss knitting magazine. I am hoping... for spring to finally arrive. I am hearing... the quiet. Goodwill, and have three large bags of yard sale stuff. I am amazed. One of my favorite things... is Diet Dr. Pepper. A few plans for the rest of the week: To continue with my de-cluttering project in the hopes that I will get inspired to paint. I put this is the mail today and I am praying it arrives safely. I have heard many horror stories about sending mail to Peru. This box has my sweet grandboy's birthday present in it and it would break my heart if he doesn't get it. 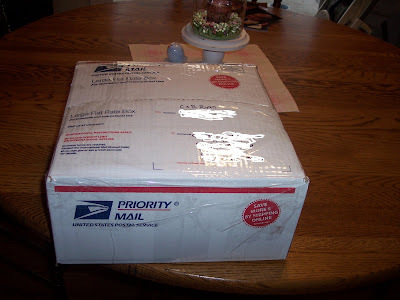 When the postmaster asked me how much I wanted to insure it for I was thinking "Oh I don't know, how about $5000? It's got lots of handmade love in there - stuff that can't be replaced." Before I could say anything though, he said, "Oh never mind. The most you can insure it for is $125." Alrighty then. You better make sure it gets there mister. Sigh. Have I mentioned how much I hate that Peru is so far away? 1053 days to go. This week I have pictures to share my five faves for the week. 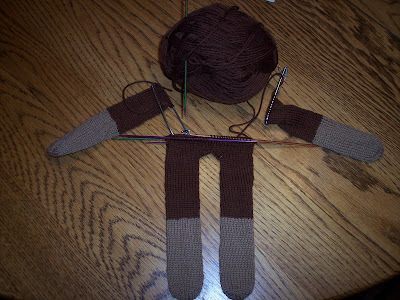 I found the cutest knit sock monkey kit ever - over at KnitPicks. I had some time to start on it and it took me oh about 10 seconds to realize I was in over my head. I knit hats. And dishcloths. You know, things that don't take a lot of thinking. Things you can knit and watch tv at the same time. But I plunged in and oh my, is it fun! I love a challenge. The first thing you begin are the arms and it made no sense to me at all how they wanted you to start it. So after two evenings of studying it, I devised my own way and it worked! If you knew me, you would know that I rarely ever deviate from the directions on anything I do. I am very black and white and goodness, who knows what could happen if you don't follow the rules! But I am very proud of myself coming up with this idea. I even posted about it on the knit-along on the KnitPicks website and somebody told me I was brilliant! Imagine that! I'm using size one needles. They are like those little pick up sticks we played with as kids! But it's coming along and I'm really enjoying it. I have mentioned before how wonderful the Harmony knitting needles are that KnitPicks sells. If you knit, you really need to try them. They are so smooth, they flex a bit so your hands don't get so tired, the tips are sharp, which I just love, and they are beautiful. My goal is to get them in every size. I love them that much. I won a contest on Michelle's blog, Big Blueberry Eyes! Yay me! I have always wanted one of these bath pillows - I usually just roll up a towel that acts like a wick and soaks up the water until my hair is all wet. I have a date with my bathtub this weekend - I'm going to pretend I'm a lady of leisure. When I opened the box this came in the delicious smell of chocolate invaded my senses as though I were standing in the middle of the Ghirardelli chocolate factory! Amazing! Thanks Michelle! I put out a little spring decoration on my table this week. I am so happy for the long cold winter to end. It's still cold. But spring's a comin'! I just love these little bird salt and pepper shakers! They just make me happy. And speaking of birds and spring, this morning I looked out in the back yard and saw dozens of these sweet little robin birds jumping all around. That's a sure sign of spring! And my seedlings are doing pretty well. I am waiting for a warm enough day to start hardening them up outside. So far that hasn't happened. I can't wait to get these all planted. Soon. Very soon. Well that's it for me. Have a happy weekend doing whatever makes you happy. As for me, I will be soaking in the tub, knitting, and doing some organizing of closets and drawers. Those are some of the things that make me happy. Over 30 years ago, when I met and fell in love with my future husband, we talked about a lot of things. We could talk for hours on end. We talked about ourselves, each other, our plans for the future and how many kids we would like to have. We talked about his call into the ministry. I was good with that as I had always felt called to be a minister's wife. I envisioned ourselves living in an attractive parsonage located in the suburbs of a big city. But I don't ever remember talking about my husbands love of all things horse. In fact, I can tell you that I had no idea at all that my husband was a "closet cowboy". I never guessed that he dreamed of someday having his own horse. I had no idea that he would love to get into breaking and training horses. For Pete's sake, I didn't even know he would like to have a pair of cowboy boots! I don't know why that never came up. But it didn't. In the first years of our marriage we lived in cities. My husband was still in school when we got married and we lived in a dormitory where we were the Resident Director's. No room for a horse there. We then moved to Kansas City to attend seminary. I loved living in the city. I worked right in the middle of the downtown area - and it was wonderful. For me. My poor husband nearly had a nervous breakdown trying to live and drive and survive in such a large city. He looked forward to the day when his first church would most certainly land us in a small, rural community. It didn't happen. Our first church with attached parsonage, was smack in the middle of metropolitan Provo, Utah. Lots of people wouldn't think of Provo as a large city but it may as well have been New York City as far as my husband was concerned. We lived right off the interstate on a very busy street. Our apartment was attached to the church. There was ZERO privacy. Three very long years later God finally planted us in a very rural, very unpopulated, very cowboy area. My husband thought he had died and gone to heaven. It took him all of about 3 months to acquire a horse. We have lived cowboy ever since! I discovered that I can live most anywhere and be content. (However, I do need to be close enough to population that I can drive there in a reasonable amount of time.) I have learned to love and even crave the solitude that living in the country brings. I would miss it if I had to move away from it. But what I love the most is seeing how happy my husband is. He loves working with his horses. Many people in our church have working ranches where he gets involved with brandings and cattle drives and all sorts of western things. This last weekend we drove to the Oregon coast to watch a friend from our church compete in a Wild Mustang Challenge. The BLM gave him a mustang and he had 90 days to break it. All the competitors met in a large arena to show what their horses could do. There were also famous horse trainers there and we sat in on some of those sessions too. I really enjoyed myself. Of course I brought my knitting along so I could accomplish something too. My word, I think even I could break a horse now! I guess I just say all of this to say that even though we don't know where life will lead us, there is much to enjoy along the way. If someone had told me that I would attend horse seminars and actually enjoy myself, I would have laughed in their face. I had no interest in horses or many outdoor activities. But it is what my husband loves. And because I love him - I enjoy watching him enjoy himself. He is a very busy pastor who needs a physical outlet to balance his very mentally straining occupation. I'm so thankful God has provided for him by where we live and who we live among. I learned early that my husband would never survive in a city. He needs the outdoors. I surprised myself by learning that I can be happy living in a rural desert. My hobbies and activities can be done anywhere. So last weekend as I was happily knitting away and at the same time learning from famed horse trainer, Craig Cameron, how teaching and requiring flexibility and balance in a horse is the secret to breaking it - I realized that maybe breaking horses and surviving a marriage aren't all that different. Flexibility and balance are the secrets to successful results both in horses and in people. On our way home we passed through a town that has a fabulous quilting/yarn shop. My husband was more than willing to stop so I could spend as much time as I wanted browsing and enjoying myself. He shopped with me and even though I know he has absolutely NO interest in fabric or yarn or patterns, he asked questions and showed genuine interest in what thrills me. He even stood in line at the counter getting my fabric cut for me so I could check out the yarn shop. We had a great time. I'm pretty sure there will be more horse events in my future. I'm also sure there will be more quilt shops. Outside my window... Although there is a very cold breeze, splashes of sunlight are playing on the brick building across the lawn. I am thinking... that after taking a nice four day road trip, I was really not ready to come home yet. I am thankful for... get away times. They are so rejuvenating. From the learning rooms... I am trying hand applique. I feel like a little kid learning how to color. It's hard to keep straight and smooth lines. From the kitchen... there hasn't been much going on in my kitchen lately. Since the kids have left home - popcorn for dinner works for me. I am wearing... black pants and shirt and a white and black sweater. I am creating... a special birthday gift for my little grandson who will be an unbelievable ONE YEAR old in just a few weeks. It has to be special, something that makes him think of and remember us, and small enough to fit inside the flat rate box that is soon taking off for Peru. I think I have come up with the perfect gift. I'll share more about it later - as his mama reads this blog and I wouldn't want her to tell him what it is! Suffice it to say that we have all had a fun time watching it come to be. I am going... to Subway for lunch. I am reading... the mail. I am hoping... for warmer weather and less wind. I am hearing... the furnace running. I don't want to hear the furnace running. I would much rather hear the air conditioner. Around the house... I am getting ready to clean and paint. I think I have finally decided on colors - that is always the hardest part for me. One of my favorite things... is taking roadtrips with my husband. We just got back from the Oregon coastal area where we watched a friend compete in a Mustang Challenge (where he had 90 days to break a wild mustang. He placed 6th and he was very fun to watch), discovered some quaint quilt and yarn shops, and visited with family we don't get to see often enough. It was so fun to get better acquainted with our youngest neice and nephew who are 3 and 6. Sweet Molly, who is 3, wrapped my heart around her little finger by calling me "Red Robin" as opposed to Aunt Robin. Grayson, who is 6, was delightful as well. He is definitely 'all boy' while being very well-behaved and good mannered. We had a great time. A few plans for the rest of the week: include some spring cleaning as I get prepared to paint. I would rather take a beating than paint - but I am getting closer to convincing myself to do it. Here is picture thought I am sharing... can you believe I just got home from a road trip through some of the most beautiful country ever, and I didn't take one picture? Not even one. I think that calls for a re-do! Check out some more Daybook entries by clicking here. 1. Last Friday evening, sweet Ava spent the night with us so her mama and daddy could spend some time together - like in the old days! We loved having her. She was so good and sweet and she slept until 4:00. Then I put her in bed with us and she snuggled up and went back to sleep. It was precious to just lay there and watch her to sleep. She is sooooo sweet! 2. My son-in-law Jayson is so thoughtful and sweet. He is always looking out for how he can help and meet a need. This week he heard me say I needed something at the store and the next thing I knew, he had left the house and gone to get what I needed. I didn't even ask! He is not just a good son-in-law, he is also a wonderful husband to my daughter and daddy to my granddaughter. He loves Jesus and desires to serve Him with all his heart. I am so glad he is a part of our family. 3. We attended a crisis pregnancy center fund-raising banquet this week. I whole-heartedly believe in the mission of this charity. I was challenged to knit some baby things to donate. I can't wait to get started! 4. A girl in our church had her first baby this week and I went to visit them at the hospital. There is simply nothing more precious than watching first-time mama's and daddy's with their tiny baby! It just melted my heart. 5. This post written my Beth Moore's daughter Melissa. It touched a chord in me and I printed it off to use in a deeper study. Lamenting to God is something we don't talk about much. I think we need to talk about it more. Have a happy weekend! And if you want to read more posts - click on over here. So after turning 50 a few months ago, I finally made myself make a doctor appointment. It has been so easy not to go all these years. My physician had retired several a couple years ago and I just hadn't gotten around to finding a new one. I struggled trying to choose the perfect one. I had been pretty impressed with the doctor who delivered my granddaughter, so I finally made an appointment with her. That was the biggest problem in my mind. It was a "her". Call me chauvinist, but I like my doctors and my airline pilots to be men. I finally went and found Dr. She to be very nice and caring and kind. And knowledgeable. She took the time to talk with me at great length about questions I had. She even took the time to discuss what was going on in my personal life. I can't say any Dr. He's have ever done that before. And what impressed me the most was that she actually remembered who I was from my granddaughter's birth. So I was really liking her. And then she gave me a list of tests a mile long that I need to have "now that I am 50". So this week I underwent the first one. And without going all Katie Couric-y on you, let me just say that it wasn't as bad as one envisions. There is a lady in our community dying from colon cancer. I'm thinking the inconveniences I went through are nothing compared to hers. I was very appreciative of the fact that they gave me something to make me sleep "during the procedure". It worked really well. In fact, I was thinking that it might be something I should take the next time I have to get on an airplane. Except my husband would have to learn how to do an IV. But he would probably be willing. Apparently as I was waking up, he was holding my hand, and I looked at him and smiled and said "You are my favorite person and I love your goatee." He's been smiling ever since. This week seemed to fly by. I'm not sure why because I didn't really do anything. Nothing I wanted to get done happened - the leaves didn't get raked because of the RAIN and the WIND and the HAIL and the COLD spring weather we have been having. I had hoped to start sewing on Ava Claire's spring wardrobe collection - but I didn't seem to find the time to do that either. I didn't get started on any new books because I just haven't been able to concentrate on reading anything other than flyers that come in the mail lately. Looking back on this week, I'm not sure what I did - so it's probably good that I have this designated opportunity to review my five favorite things of all the "nothingness". 1. I have already mentioned our ladies retreat last weekend. It was a very relaxing weekend that I enjoyed very much. Staying in a place like this can't help but make you happy. Every room has a fireplace and is decorated to the extreme. It is the most feminine place I have ever been. The staff go out of their way to make you feel welcome. Their food in incredible. And the prices are unbelievable. To stay in a room for 4 for 2 nights cost $100 and that included all your food. This place has been a God-send to our ladies group. 2. Ever since Angie declared that 2009 is The Year of the Scarf, I have enjoyed pulling out my scarfs and learning new ways to wear them. And this week Walmart had their scarfts marked down to $3. $3 is a price I think all of us can afford to add a little touch of beauty into our lives. 3. Reading your blog posts every day is always a favorite thing. I learn so much from all of you and besides that you make me laugh, and pray, and you give me such great ideas. You are definitely a favorite part of every week. 4. Every day my daughter Jess drops in to see me at work. She is a student here at the university I work at. What a delight to look up and see her coming through the door. She always brings a smile to my face. 5. This sweet little angel. 'Nuff said. Thanks Susanne at Living to Tell the Story for another great reminder of all the good things in life. Go on over and join us! A couple of posts ago I talked about how my little granddaughter Ava Claire's dog, Junie, really seems to love her and posts guard by her crib when Ava is sleeping. Well last night we were at their house for '24' night (the night we get together and watch 24) although last night did NOT go according to plan-more about that later. Anyway, I took a couple of videos of sweet Ava with Junie - I thought it would be fun to share them. In this first video you can hear my preacher husband with his preacher voice discuss the finer points of a chuck roast. We are an exciting family to be around. In this next one you hear my husband explaining to my son-in-law why he is attempting to grow the goatee again. He has a variety of reasons Including something about having the flu - but I know the real one. It's because Tyler didn't like it and wouldn't give him anymore kisses. As soon as that was realized, the goatee disappeared. But now Tyler is gone - and the goatee is back. At the end you hear him giving Andrea a "rice-cooking" lesson. He is a man of many talents! We had a wonderful dinner of roast and rice. But we never did get to watch 24. After we ate, Andrea noticed that Junie was missing. We searched the entire house high and low. We searched the backyard. We even checked the freezer I'm not sure why except that we were getting desperate. We walked the neighborhood with a flashlight calling her and calling her. We knocked on doors. We finally made signs and hung them all over. We drove through a larger area of the community with our windows down calling and whistling for her. She never came. We finally had to give up for the night and it was very sad. 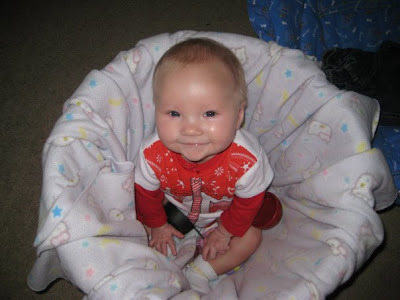 We prayed together that she had found a warm home to stay the night in and that God would help us find her again. I can't tell you how sad it is to lose your dog. I hated leaving - but I knew there was nothing more we could do. I woke up in the night praying for that little dog. Well the happy news is that this morning Junie is back home. Andrea said she was sound asleep and she woke up and she just knew. She doesn't know if she heard her barking in her sleep or if she just "knew" but sure enough - there Junie was at the back door wanting to come in. She is none worse for the wear. I think someone found her and took her in and as soon as she wanted out to go potty - she probably headed straight home again. You can be sure there will be some repair work going on with the back yard fence. Beth Moore has a fun post going on over at LPM. She has challenged everyone to leave a comment on their favorite book. Wow! Choosing a favorite book is super-duper hard. Nearly impossible. I love so many of them. But I finally chose Francine River's, Mark of the Lion series. And it is really three books - but they are all one story. Does that make sense? You could never read just one and not the others. I am happy to see that "Redeeming Love" has been entered so many times as well. If you haven't read that book - you really, really, really need to. If you haven't been over to LPM yet, get a pad of paper and a pencil and prepare to spend some time jotting down must-read books! And prepare to spend some time there - as of now there are 1094 comments! I know this last weekend at our Ladies Retreat, we had the opportunity to purchase books from Robin Lee Hatcher. It was like Christmas! I'm dying to know how the reading is going? I think her favorite book of mine is "The Forgiving Hour" followed by "Firstborn". I bought some new ones that I haven't read yet and I'm looking forward to starting those. Life is good when it is filled with books! Outside my window... The sun is shining, the wind IS NOT blowing (Praise the Lord! ), and it looks like spring could be here. I know better though. Spring is a big tease - it plays with your mind and just makes you THINK it's going to warm up. Then it dumps snow. Mean old spring! I am thinking... that I enjoyed our women's retreat this weekend very much. Our speaker was Robin Lee Hatcher and she was wonderful. It was so interesting hearing how she writes her novels based on things that have happened in her own life. She loves the Lord so much - she was very inspirational to me. From the learning rooms... I am learning that I am not finished learning. Or growing. The older I get, the more I realize I need to learn. And some of those lessons can be really hard. I am thankful for... a dear friend of mine. Even though she is going through a hurting time in her own life, she never missed an opportunity to show love and kindness to me. She is a dear gift from God and I only hope I am half the friend to her that she is to me. From the kitchen... my poor kitchen has been neglected lately. With all the kids gone - I just don't really cook. But I have found a great recipe for a Blueberry/Creamcheese Coffee cake that I think I'm going to have to try soon. I can't remember who's blog I found it on - I'll let you know though when I make it. I am wearing... my new pink scarf. Big Mama featured it on her Fashion Friday post last week. It was from Target, it was inexpensive, it was just what I needed. So I bought it and it makes me happy. I am reading... I bought 2 new Robin Lee Hatcher books that I haven't read yet this weekend - they are on the top of my book pile. I am creating... baby hats. And more baby hats. I am entertaining a thought of selling hats to help fund my mission trip to Peru next February. Our church is sending a team down and I have been invited to go along. Of course, my purpose would be to spend time with my little grandson and my daughter and her husband. I haven't decided for sure if I am going yet, but if I do I'm thinking about selling baby hats. So I can go see my baby. And maybe even bring him a hat. Or two. I am hearing... somebody practicing scales on the piano. One of my favorite things... is red licorice. A few plans for the rest of the week... cleaning the house, catching up on the laundry, sewing Miss Ava Claire's easter dress. And I really, really, really, want to get the rest of the leaves raked.